Click here to check out other Friday Foto Friends posts and click here to check out other SkyWatch Friday Posts. Here are a few pictures from my week. Library Park - I love this little park gazebo next to our library. This is the cutest statue, in my opinion. Those are my pictures for this week. Thank you for visiting and I hope you have a great weekend! 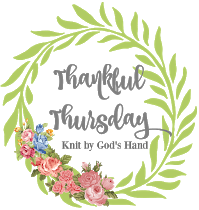 It's getting rather late in the day, but I still want to join in with Rebecca at Knit by God's Hand for Thankful Thursday. Click the button above if you'd like to link up also. **Today we are having a beautiful day. Lucy and I got up at 5:30 and took a walk. It was just the beginning of daylight. The moon was still up and was humongous. Unfortunately, I didn't take my phone with me this morning, so I couldn't get a picture of it. **Yesterday we finally got an estimate on getting a new roof on our house. It was less than half of what we were expecting it to be. Now, I know it's an estimate and it could be more if he finds some damaged boards underneath. But still, I'm thrilled with the estimate. Plus this guy did my sister's house a few years ago and they are very satisfied with his work. **Last Friday night I was watching TV and looked up and saw a wet spot on the ceiling (thus the new roof mentioned above). We've had quite a bit of rain since then, but so far God as protected our house and no more spots have shown up. I prayed and asked him to place a tarp over that spot and thankfully He has. And hopefully, He'll keep it covered until the roofer can do the job in about 1-2 weeks. Prayers would be appreciated. **Thankful for my new iPhone and for the little cheap cover I got for it from Amazon. Loving it and loving the camera on the new phone so far. Much better than my old one. ** Thankful for this little girl that goes on all my walks with me and most mornings wakes me up early so we have time to walk and I have time to read my Bible. She's quite the character, but I love her and am very thankful for her. Hope you are having a blessed day and thank you for visiting. I believe you can have security and freedom in Christ! That's the best place I know. Gettysburg. We went about 10 years ago and it was so amazing to know that I was standing where Lincoln had spoken the Gettysburg Address. I also, love Lincoln's Monument in Washington DC. 3. Free as a bird, free reign, be free of, free enterprise, free trip, walk away scot free, free for all...which 'free' phrase can best be applied to your life in recent days or weeks? Explain. I'm not really sure any of them apply to my life right now. 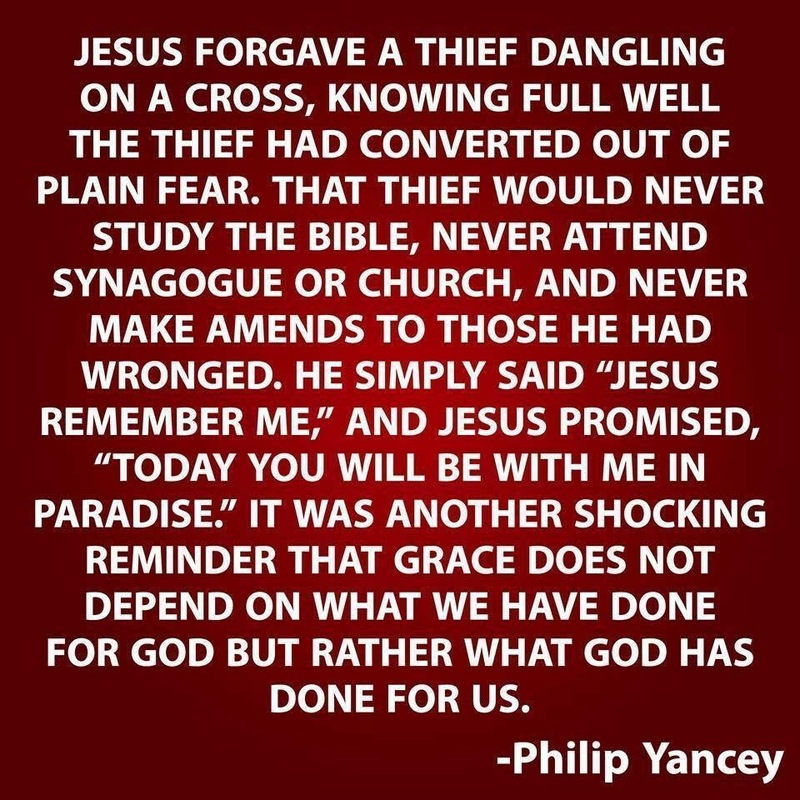 Maybe walk away scot free, since that is what we do when we accept Jesus as our Savior. Hoping to be free as a bird some day when I retire. Thought it might be this year, but I'll probably wait about 3 more years. Red in my fridge is ketchup, white in my house is the bathroom sink top, something blue in my view right now would be my pants (I'm on lunchbreak at work and wearing Navy pants). 5. July 27th is National New Jersey Day. Have you ever visited The Garden State? If so where did you go? Are there diners where you live? Have you tried Taylor Pork Roll? Do you like to play Monopoly? Salt water taffy-yay or nay? How do you feel about shopping at the mall? Springsteen, Sinatra, or Bon Jovi-you have to pick one. Never been to New Jersey. I'm sure there are diners somewhere near, but I don't know where. Never heard of Taylor Pork Roll. Yes, I like Monopoly but I haven't played in years. I like vanilla, chocolate and peanut butter salt water taffy. I do not really care for shopping, that being said though, I do like to go to a mall and people watch. Sinatra. I have no idea unless they all came from New Jersey first. I love this little teapot and ottoman tray at my sister's. I don't even drink tea, but I do love to see a pretty teapot. Hope you are having a great day. Thanks for visiting. 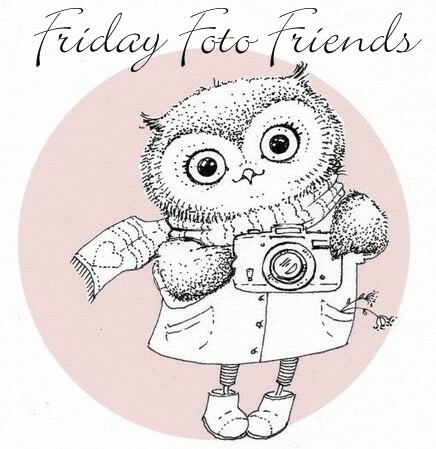 Time for Friday Foto Friends. Click the button above to participate. Here are my pictures from this week. Playing with the camera on my new phone before work this morning. Our back yard. The farm I always take pictures of is on the other side of those trees. So glad to have Rebecca back this week after all she has been through in the past couple of months. 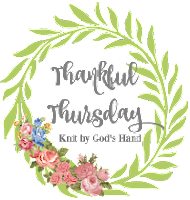 You may click the button above to participate in Thankful Thursday. **my new phone. It has room for lots more pictures!!!! And the camera is supposed to be a lot better too! **an app called Marco Polo. I prefer live chat, but my older daughter prefers this and at least I get to see her face and she's talking to me a lot more than with text, phone or live chat. I'll take it. **Bible study last night at church. We talked about child-like faith and what that really means. One thing it means is praying and really expecting God to answer. I'm asking God to help me to expect more from Him and just really to believe it if He says it. I love these people and all the good conversation we have when learning more about God and His word and living with and for Him. Hit the button at the top if you'd like to participate in the Wednesday Hodgepodge. I don't really have a bucket list, but I'd like to visit the state parks in our area a few times and go to the river and see the 4th of July parade and fireworks in our area. Rooftop because I love the views from up high. I am right now because I am trying to eat low carb. Nothing in particular. I'm listening to Disney music right now on Pandora. Disney music almost always makes me happy. It brings back so many memories of when my girls were younger. I don't have a new picture of Colton to post this week, so how about a picture of Lucy. 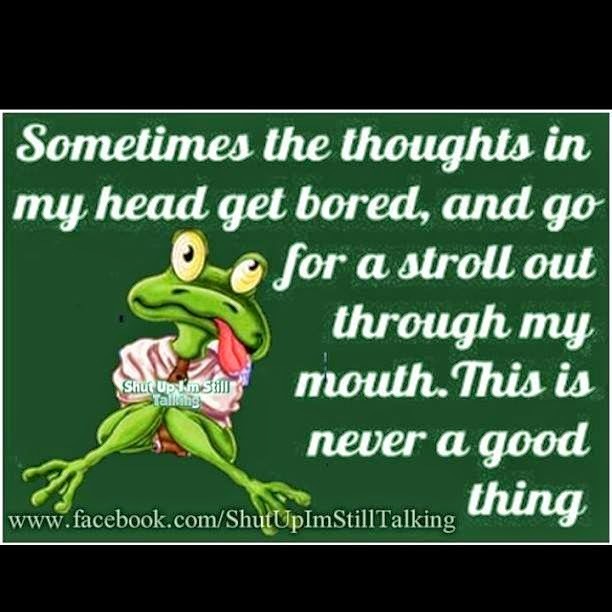 I left work an hour early on Friday and hubby and I went to Cracker Barrel for dinner. It was so nice to unexpectedly take off early and go out to eat. Then we went home and relaxed and watched some TV. We are currently binging on the old JAG series. Saturday morning Lucy and I went out for an early morning walk and then hubby and I accomplished a few things at home. It was so nice to not have to go anywhere early. We did go grab some lunch and then we went to his parent's home. Hubby stayed with his dad and his mom and I went to my sister-in-laws and then we headed to her almost daughter-in-law's wedding shower. It was so nice and we really had a good time. I usually don't like showers, but this was really nice. No pressure and everyone seemed to really have fun. Below are a few pictures. I thought these flowers were so pretty. The bride-to-be used to work in the floral department at Krogers and she is very good at doing bouquets. After the shower, hubby and I had another fairly quiet evening at home. Sunday was church and then we met his mom and dad and brother and his family for lunch. We had to wait for over and hour for a table and they were a little slow in bringing the food. But it just meant more time to be together and talk and the food was pretty good too. My husband's parents Can you believe they are in their 80's I don't think they look it. My husband's brother and his wife (they are the parents of the groom-to-be. I didn't take a picture of my husband and I, but we really were there. Both of our girls called and talked to their daddy and I think that really pleased him alot. 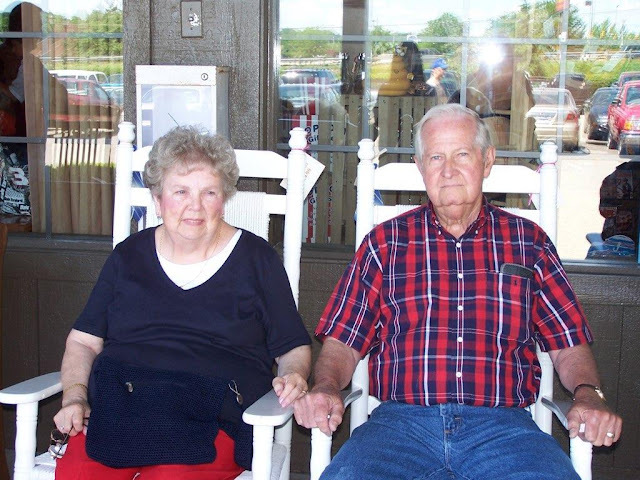 I really missed being with my mom and dad for Father's Day, but I know they are in a better place and I wouldn't wish them back here for anything. Happy Father's Day in Heaven! So that's pretty much most of our weekend. Hope you had a nice weekend too. 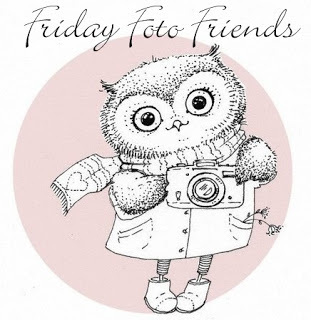 Click here to join in with Friday Foto Friends at Breathing in Grace and here to enjoy SkyWatch Friday. Here are some pictures from my week. Sunrise at the farm behind us a few days ago. This and the next 2 are sunrise photos from this mornings walk. Unfortunately there are lots of wires in our neighborhood, but the skies are still beautiful. It's Friday and time for Friday Foto Friends. Click the button above to participate. Here are a few photos from my week. Haven't made a granny square in years. Starting to get the hang of it again. My grandson and me. Sure do love this boy. Thanks for visiting and I hope you have a great week. We went to Campmeeting last night and the minister spoke on "I'm Not Tired Yet". On how we may be tired in body, but we are not tired in spirit and we are not tired in doing what the Lord asks of us. He gave so many wonderful examples from scripture and from historical figures. It was so encouraging and then he had them play this video. I just had to share it today. By the way, this is around 15 minutes long so you may not wish to listen to all of it. But it is definitely worth listening to a couple minutes of it. It just really lifts my spirits and I hope it will do the same for you. So I'm just letting you know, "I'm not tired yet!" Got married, adopted 2 children (ages 2 and 5) and learned to live as a family together. Both are hard, but I'm learning to do them. Book shelves for sure, what else are you going to do with your books. Yes, I have a Kindle but still have a lot of books I don't wish to get rid of. We still have an alarm clock, but we really don't use it any more. We use our phones. We do have a file cabinet, but actually I use a smaller file box instead now. We both have desktop computers. I just bought a new MAC computer. Yes we have a printer and use it and a paper shredder. We have a DVD player and definitely use it. We have cable TV too. That's been almost a year ago and I can't remember. But usually hubby and I just go out for dinner somewhere. We typically do not make a big thing out of birthdays. Is the weather strange where you are? I mean it’s June and I had to wear a hoodie to take my walk this morning at 6:00. What is up with that? Click the button at the top if you’d like to participate in the Hodgepodge. Thanks for visiting and I hope you have a great day. Listening to: I Heart Bloomberg by Melody Carson (listening to the audio version from my library). Thinking: I sure could use a Diet Coke this morning. Feeling: Loved by my hubby, who is going to bring me that Diet Coke after his dentist appointment. Celebrating: Each day I wake up on this side of the dirt. Grateful for: Our church family. Weather: 60 degrees and mostly cloudy. It's going to rain later. Hope you are currently having a good day and thanks for visiting my blog. Hubby and I had a great weekend. Saturday we went to Rocky Fork Lake and then Cowan Lake to just relax and take a few pictures. We got to spend a little time with our daughter and grandson on Sunday. They came to church and then we went to lunch afterward. It was so good getting to see this little one in person. Typically I'm the one behind the camera, but I was so glad to get someone to take this picture of us. Sometimes it is hard to get him to look at the camera. But that's okay. Here he was looking at his papaw. Sunday was my mom and dad's wedding anniversary and also both of their birthdays. Mom would have been 85 years old and dad would have been 90 and it would have been their 68th wedding anniversary. I miss them so much, but I know where they are and they are together and someday I'll get to see them again. 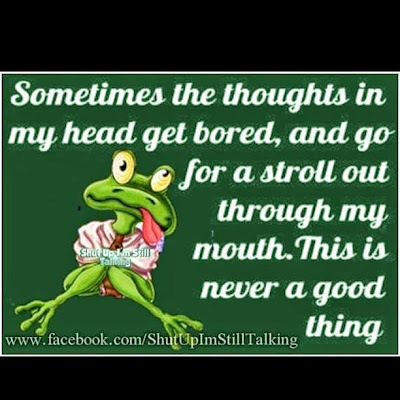 That's a bit about my weekend. I hope you had a great one too.